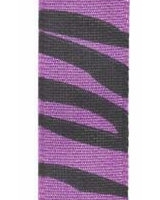 Offray purple jungle print is made of 100% polyester material and made in the USA. Perfect for all your craft, bows, scrapbooking or gift wrap needs where you need a festive touch. Manufactured by Offray you can be assured that you will be receiving a high quality ribbon.